Cbet nr. 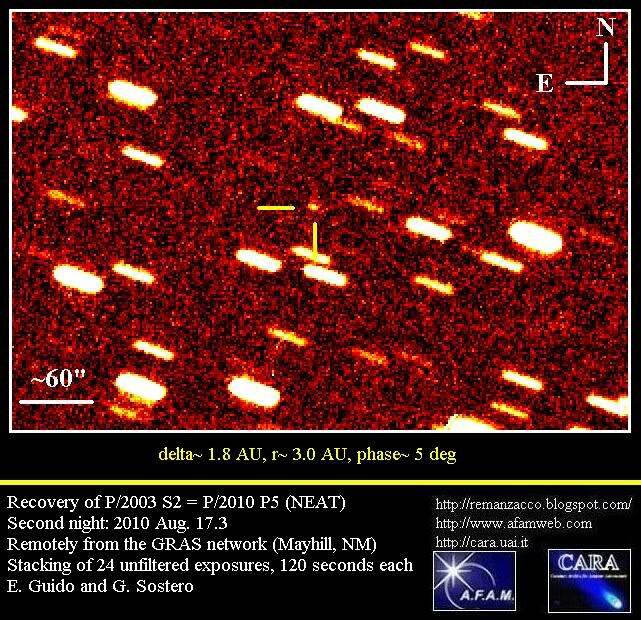 3936, issued on 2014, August 24, announces the discovery of a comet (magnitude ~17) by G. Borisov (Observatory MARGO, Nauchnij) on CCD images obtained with a 0.3-m f/1.5 astrograph telescope on 2014, August 22.02. The new comet has been designated C/2014 Q3 (BORISOV). 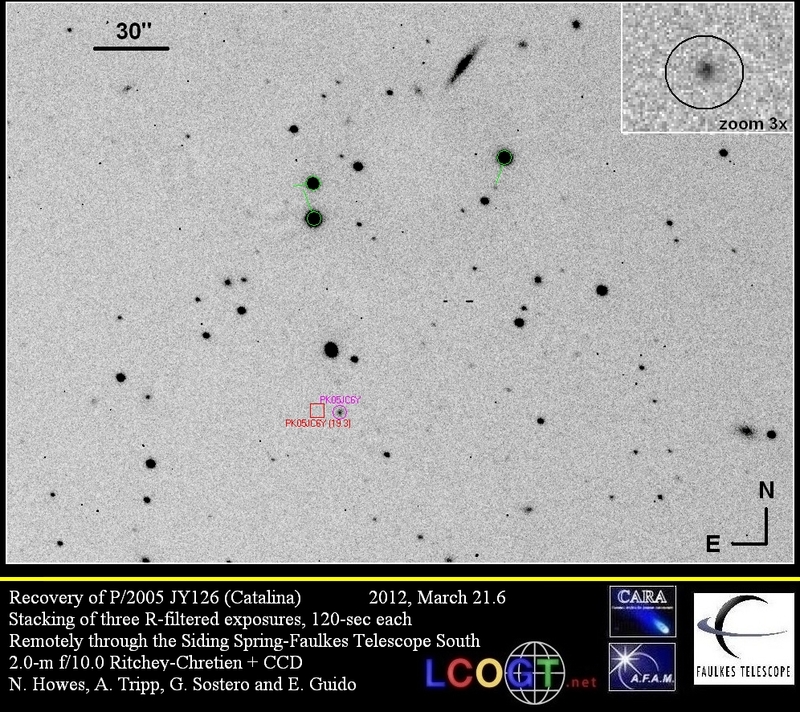 We performed follow-up measurements of this object, while it was still on the neocp. Stacking of 10 unfiltered exposures, 60-sec each, obtained remotely on 2014, August 23.4 from H06 (iTelescope network - Mayhill) through a 0.50-m f/6.8 astrograph + CCD + f/4.5 focal reducer, shows that this object is a comet: coma about 7" in diameter elongated toward PA 215 (the comet was about +21 degree above the horizon at the moment of the imaging session). 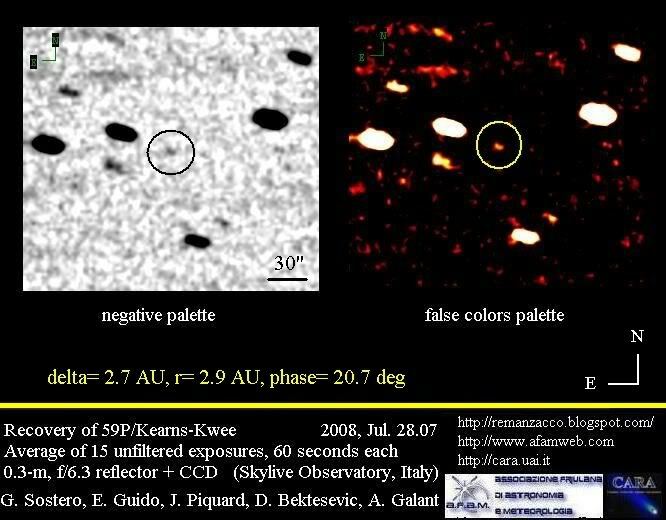 This is the third comet discovered by Gennady Borisov (previous were C/2013 N4 & C/2013 V2). Rosetta has arrived at comet 67P! After an epic 10-year journey, the European Space Agency’s Rosetta spacecraft arrived today August 06, 2014 at comet 67P/Churyumov–Gerasimenko becoming the first spacecraft to rendezvous with a comet. Launched in March 2004, Rosetta had to make three gravity-assist flybys of Earth and one of Mars to help it on course to its rendezvous with the comet. 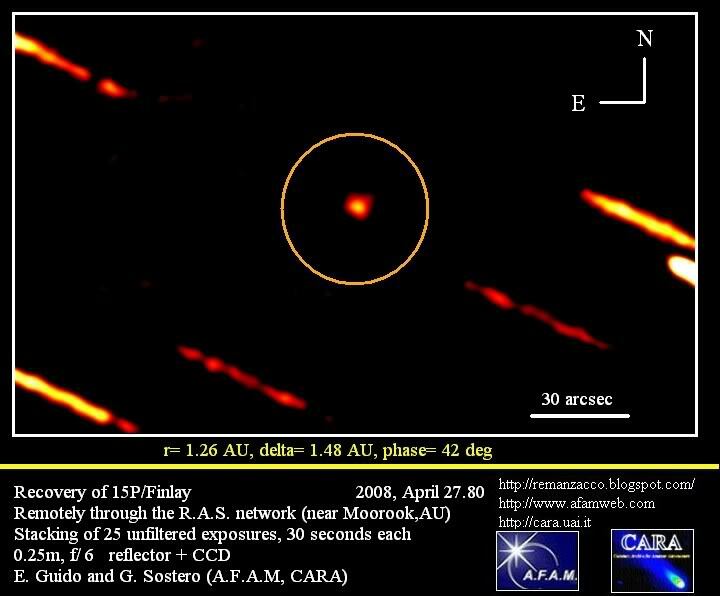 This complex course also allowed Rosetta to pass by asteroids Šteins and Lutetia, obtaining unprecedented views and scientific data on these two objects. Rosetta woke up from deep space hibernation on 20 January 2014, nine million kilometres from comet 67P/Churyumov–Gerasimenko. Following wake-up, the orbiter’s 11 science instruments and 10 lander instruments were reactivated for science observations. Ten orbital correction manoeuvres were carried out between 7 May and 6 August, reducing the spacecraft’s velocity with respect to the comet from 775 m/s to 1 m/s, equivalent to walking pace. 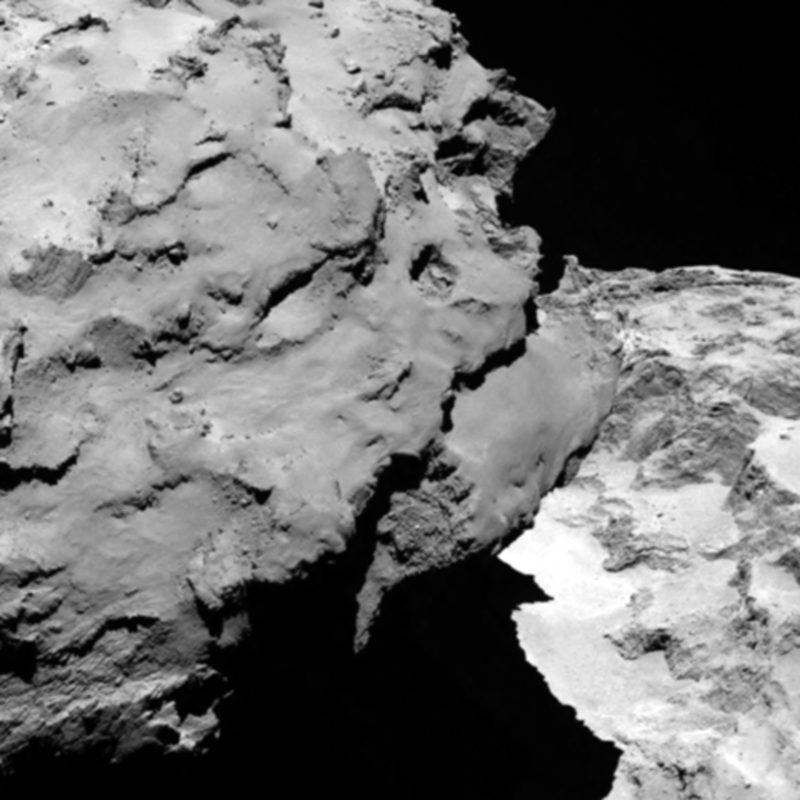 All this in preparation for the first landing on a comet expected on November. Below you can see a high resolution (5.3 meters per pixel) image of comet Churyumov-Gerasimenko taken by OSIRIS/ROSETTA on August 3, 2014 (so 3 days before entering orbit) from a distance of 285 kilometers. Click on the image for a bigger version. 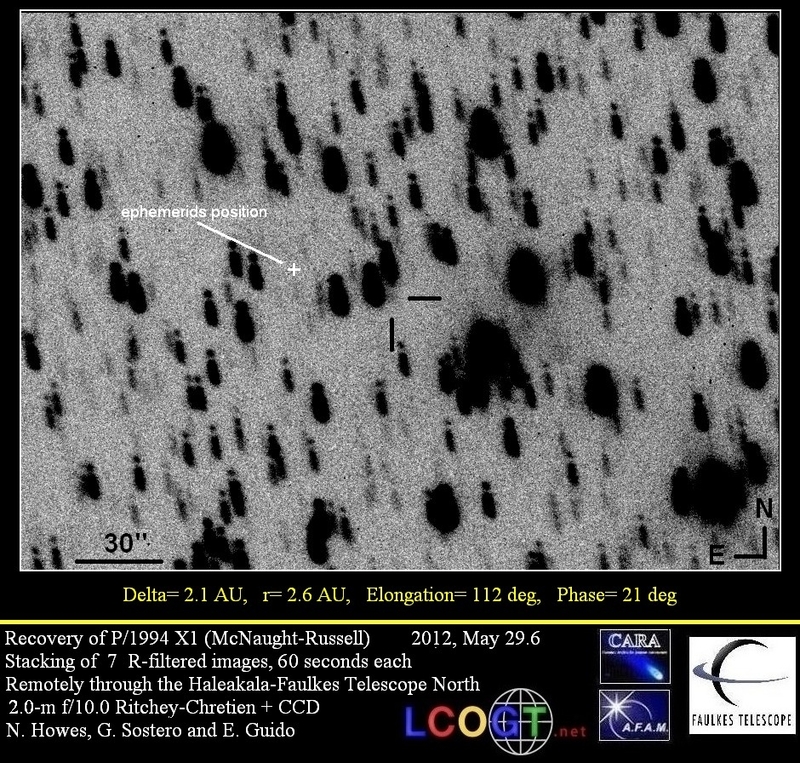 Below here's another image , showing the "other" side of the comet 67P. 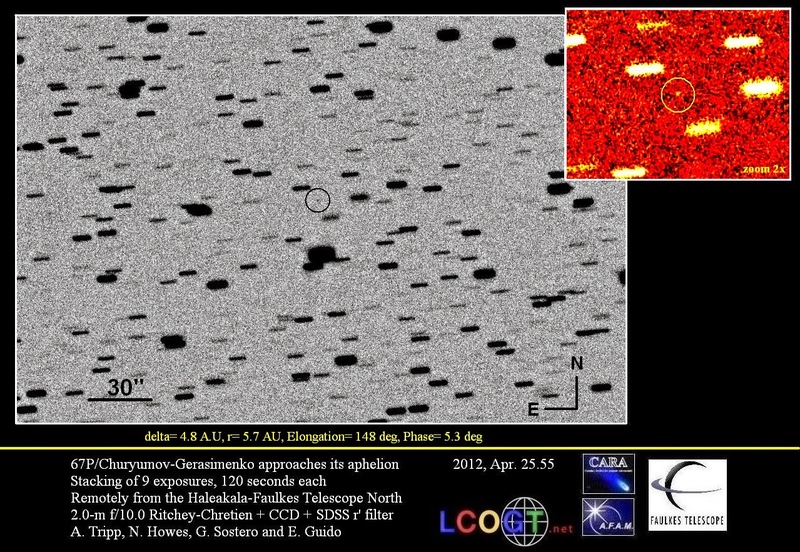 The two images are separated by about 4 hours (120 degree comet rotation). Click on the image for a bigger version. 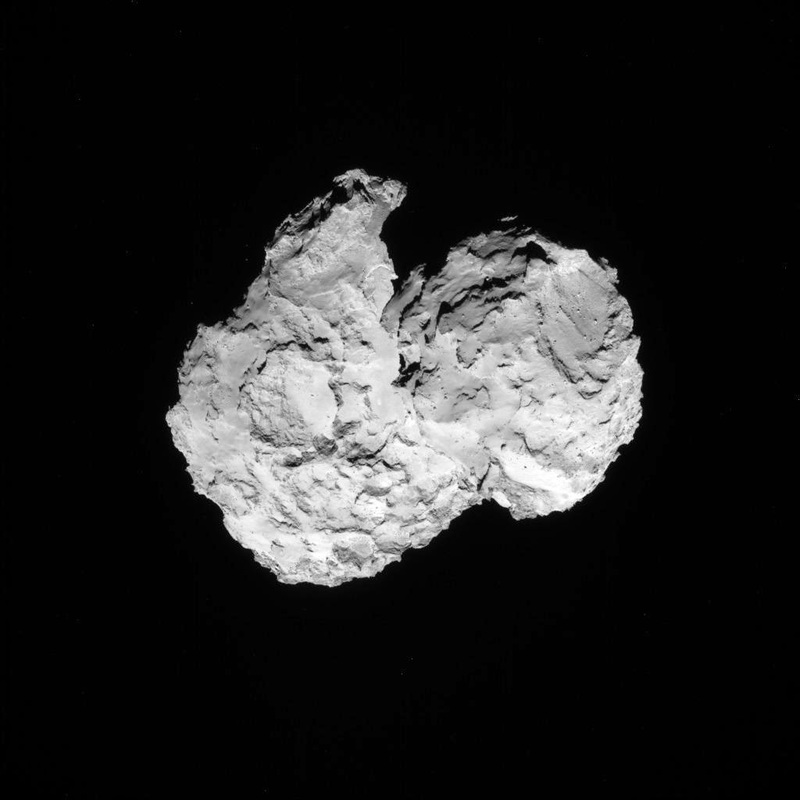 Comet 67P/Churyumov-Gerasimenko activity on 2 August 2014. 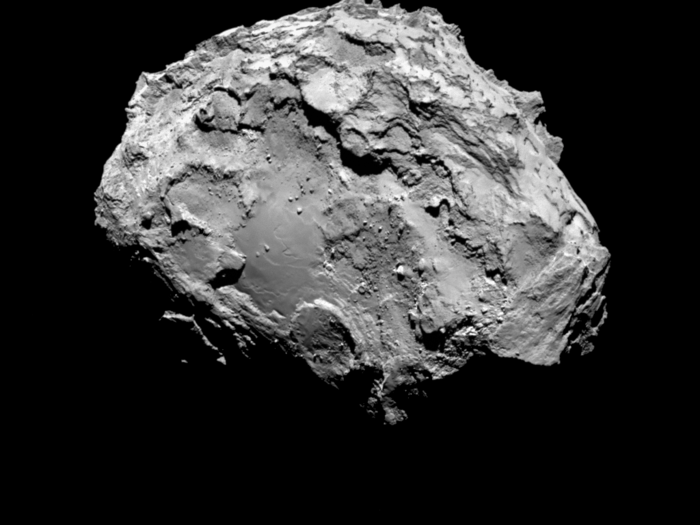 The image below was taken by Rosetta’s OSIRIS wide-angle camera from a distance of 550 km. The exposure time of the image was 330 seconds and the comet nucleus is saturated to bring out the detail of the comet activity. Note there is a ghost image to the right. The image resolution is 55 metres per pixel. 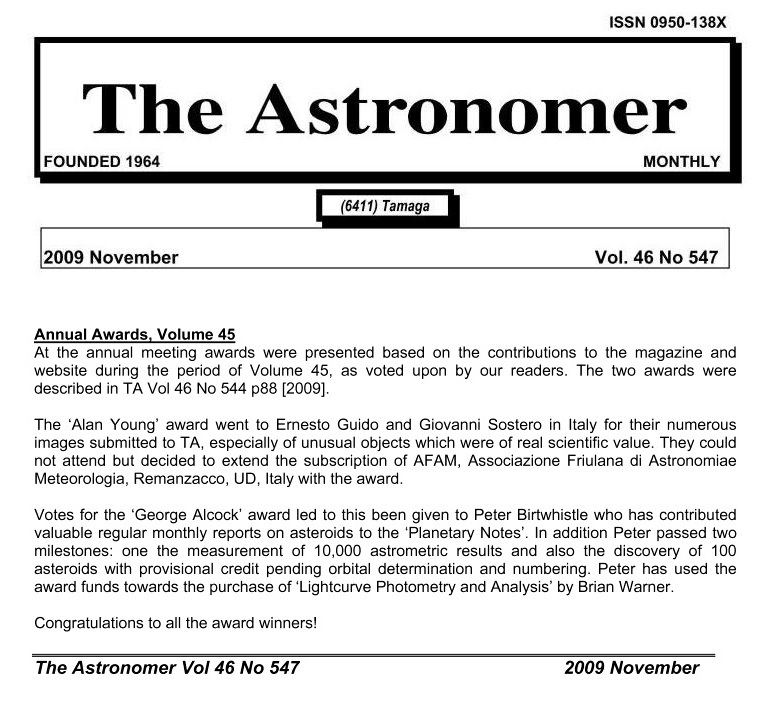 Click on the image for a bigger version. 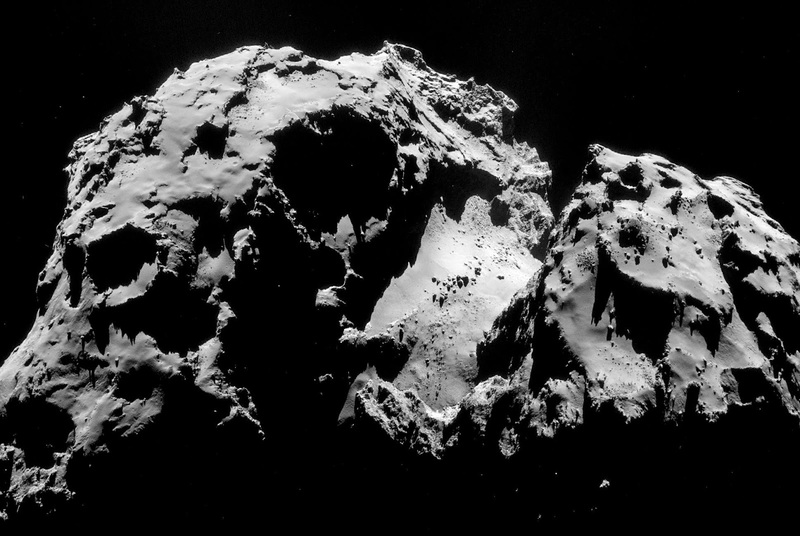 The animation below comprises 101 images acquired by the Navigation Camera on board ESA's Rosetta spacecraft as it approached comet 67P/C-G in August 2014. The first image was taken on 1 August at 11:07 UTC (12:07 CEST), at a distance of 832 km. The last image was taken 6 August at 06:07 UTC (08:07 CEST) at a distance of 110 km. Click on the thumbnail before for a bigger version. In November 2014, a small lander (named Philae) will leave the spacecraft and will harpoon itself to the surface of the comet 67P. 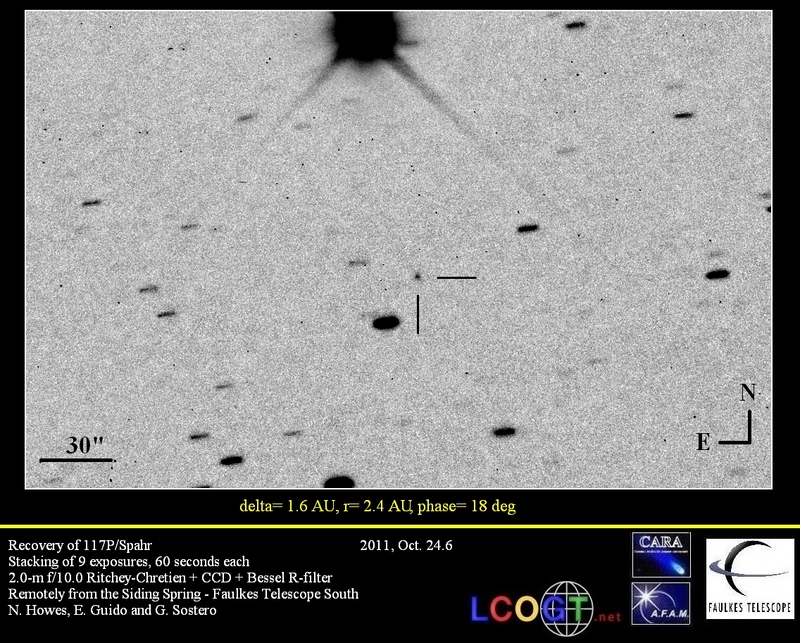 Below you can find an image of comet 67P taken by our team (Nick Howes, Giovanni Sostero, Alison Tripp and Ernesto Guido) on 25 April 2012, when comet was at roughly 5.683 AU from the Sun (so close to its aphelion) and of magnitude ~22. 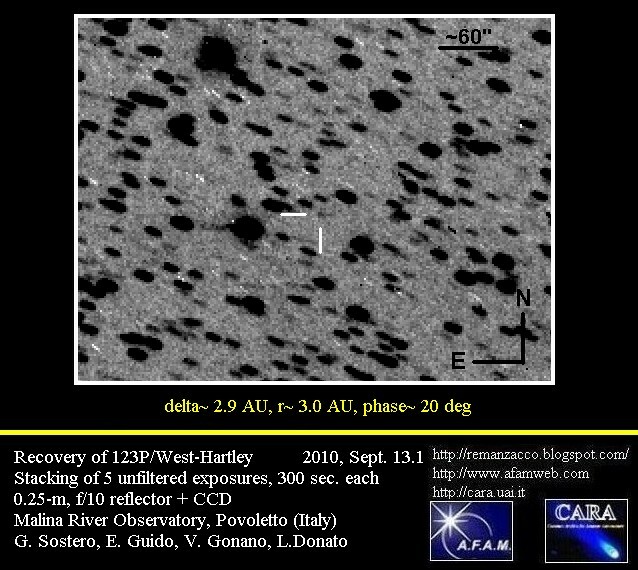 For more info on that imaging session and also for our image of this comet dated back to 2010 click here & here. This blog will be updated as soon as new images and news will arrive so stay tuned! Stunning close up detail focusing on a smooth region on the ‘base’ of the ‘body’ section of comet 67P/Churyumov-Gerasimenko. The image was taken by Rosetta’s OSIRIS narrow-angle camera and downloaded today, 6 August. The image clearly shows a range of features, including boulders, craters and steep cliffs. The image was taken from a distance of 130 km and the image resolution is 2.4 metres per pixel. Click on the image for a bigger version. While below there is a close-up detail of comet 67P/Churyumov-Gerasimenko. 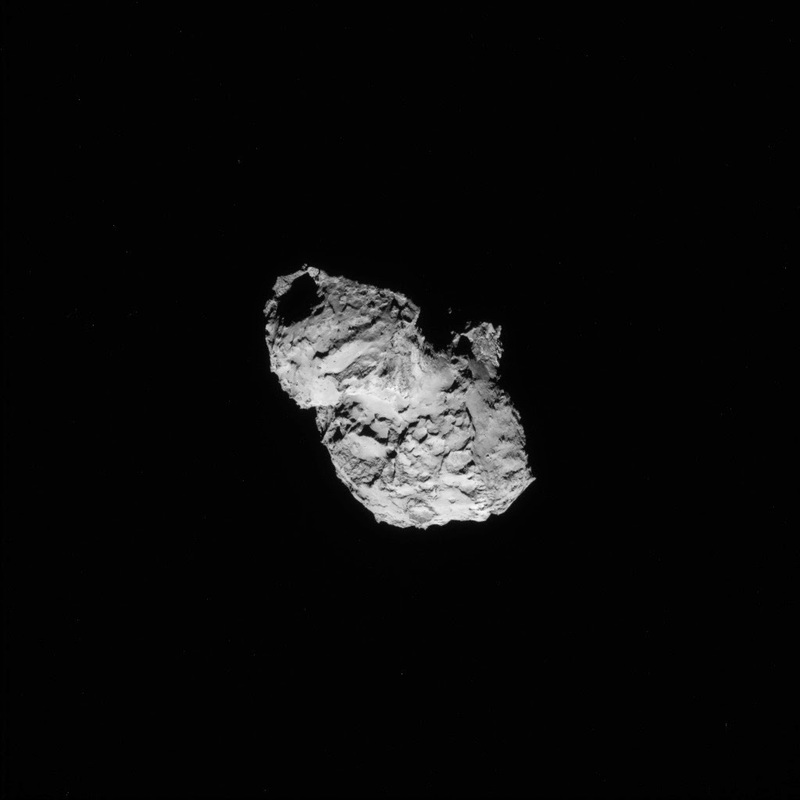 The image was taken by Rosetta’s OSIRIS narrow-angle camera and downloaded today, 6 August. 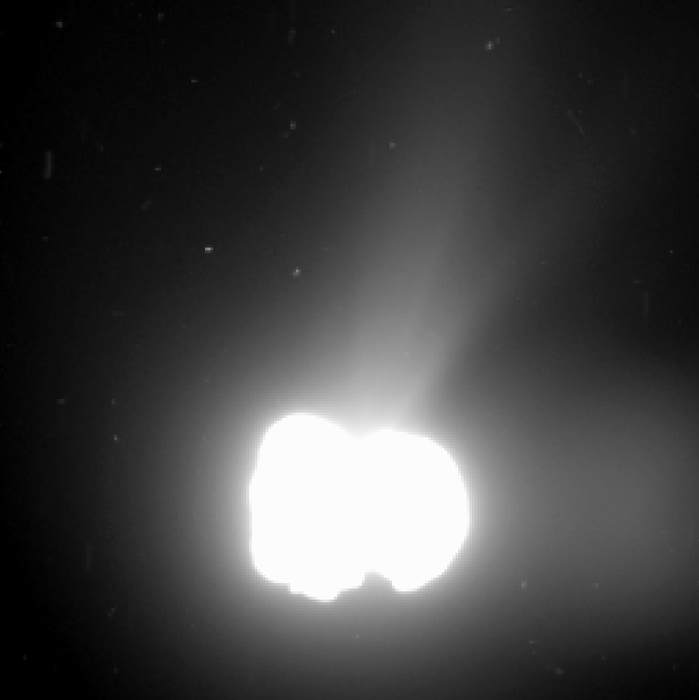 The image shows the comet’s ‘head’ at the left of the frame, which is casting shadow onto the ‘neck’ and ‘body’ to the right. The image was taken from a distance of 120 km and the image resolution is 2.2 metres per pixel. Click on the image for a bigger version. 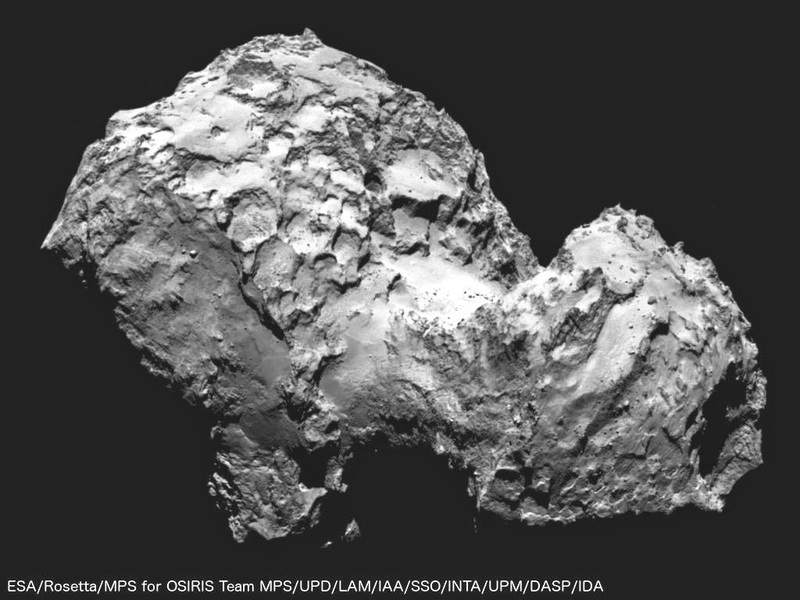 The View From Rosetta - Animation of comet 67P recorded by Rosetta's navigational camera. (Credit: European Space Agency/BBC News). Click on the thumbnail below for a bigger version. 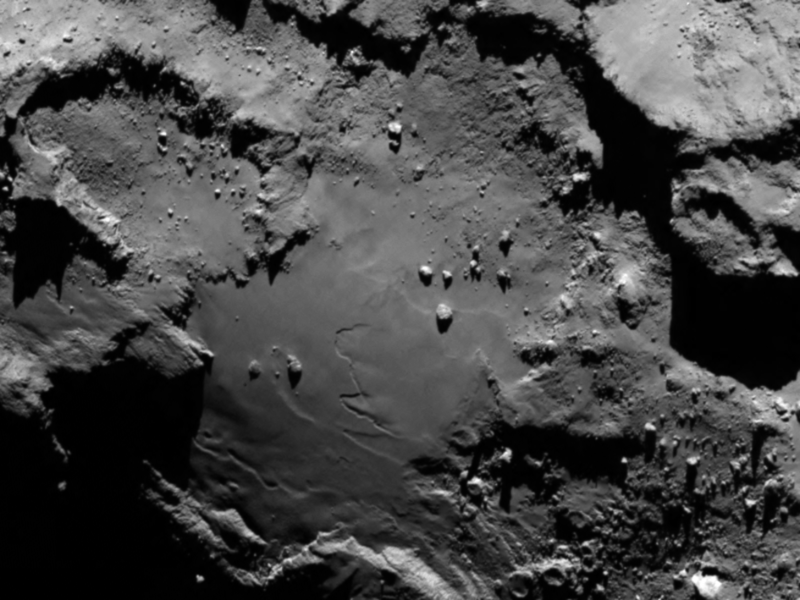 Full-frame NAVCAM image taken on 5 August 2014 from a distance of about 145 km from comet 67P/Churyumov-Gerasimenko. Click on the image for a bigger version. 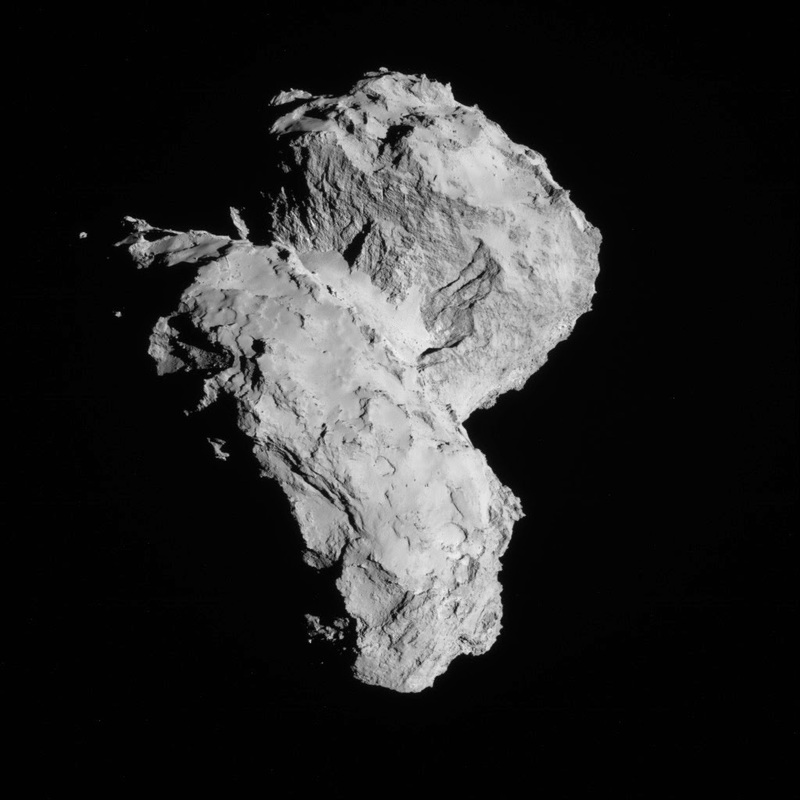 Full-frame NAVCAM image taken on 7 August 2014 from a distance of about 83 km from comet 67P/Churyumov-Gerasimenko. Click on the image for a bigger version. 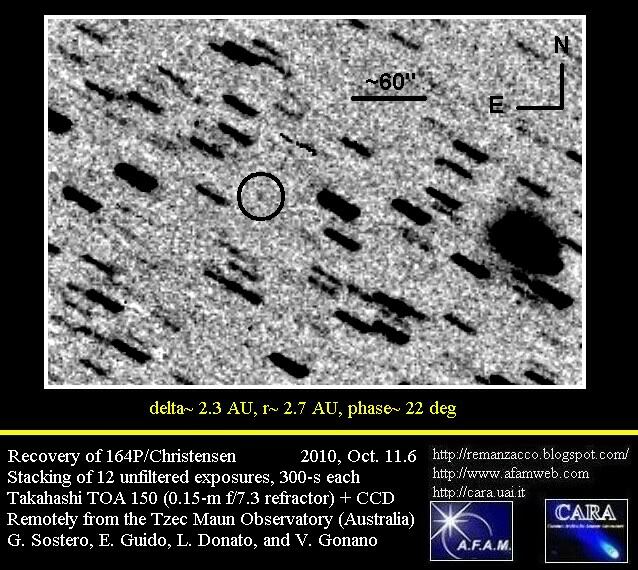 "Now that comet 67P/Churyumov-Gerasimernko is within our reach, Rosetta’s mass spectrometer COSIMA, managed by the Max Planck Institute for Solar System Research in Germany, is beginning to reach for cometary dust. Literally. On Sunday 10 August 2014, COSIMA will expose its first of 24 targetholders aiming to collect single dust particles. This might take a while. After all, from dust particle modeling, 67P/C-G’s coma is still comparable to a high-quality cleanroom. But, as 67P/C-G travels closer to the Sun along its orbit, the comet’s activity will increase and more dust will be within reach. For now, we are planning to keep the target exposed for one month, but checking on a weekly basis if the model predictions are not too low and if we are lucky." The image below shows Comet 67P/Churyumov-Gerasimenko imaged by Rosetta's OSIRIS narrow angle camera on 7 August from a distance of 104 km. 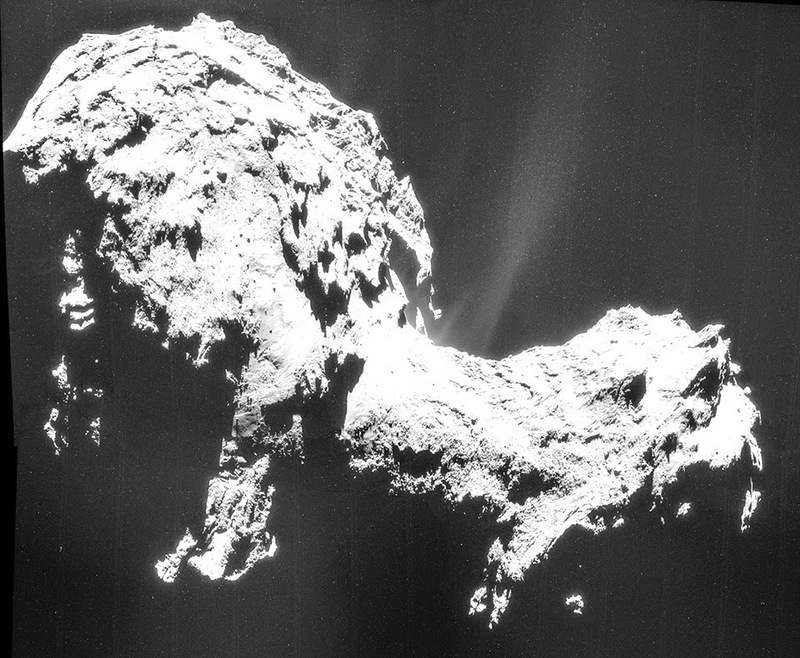 "While the comet’s head (in the top half of the image) is covered with parallel linear features, the neck displays scattered boulders on a smooth underground. 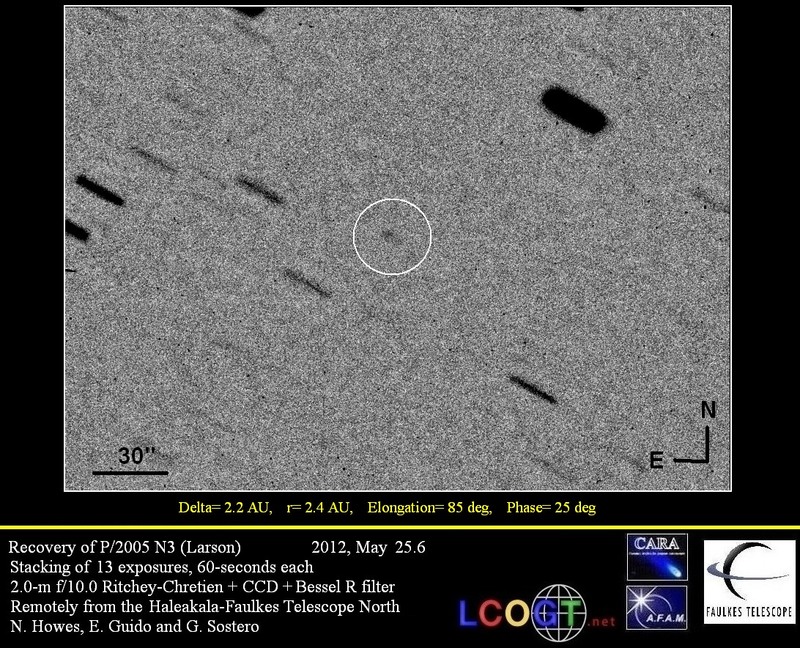 In comparison, the comet’s body (lower half of the image) seems to have much more jagged features.". Click on the image for a bigger version. A 2 day meeting started today at @CNES_France where scientists and engineers (the Landing Site Selection Group (LSSG)) will select 5 possible landing sites for Philae that will be announced on Monday. Final decision will be confirmed by the middle of October. 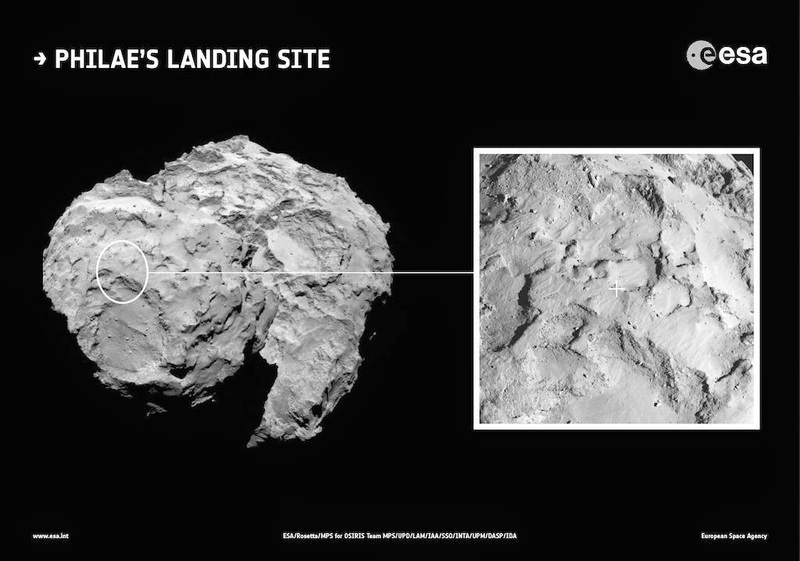 To see how many factors influence the decision for the landing site see this blog post on Rosetta website. According to Rosetta blog: "The Global Mapping phase runs 10 September to 7 October, and will see Rosetta going down to just 29 km distance, a point when we expect the spacecraft to become actively captured by the comet’s gravity, and its orbit to become circular. 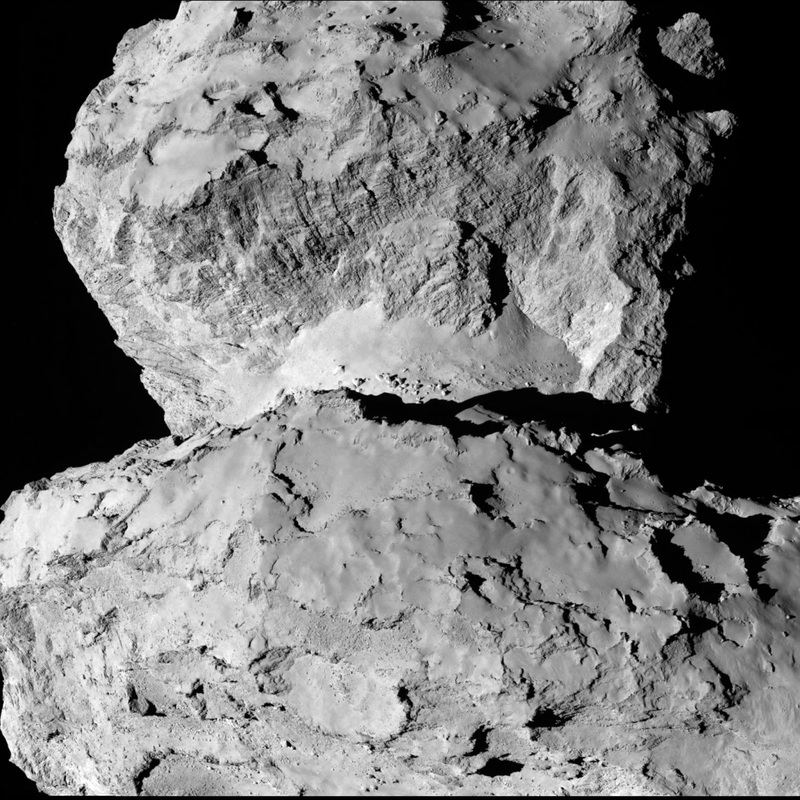 The aim is to get down to 19km height, keeping Rosetta on the Sunlit side or orbiting on the terminator line." 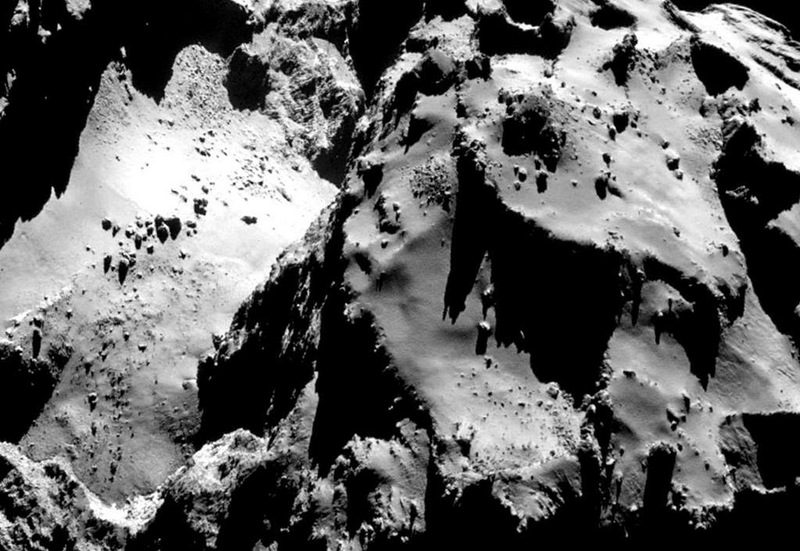 Below you can see the most recent image released by Rosetta taken by its navigation camera (NAVCAM) on 22 August 2014 at a distance of about 64 km from comet 67P. Click on the image for a bigger version. Below a Rosetta-67P related cartoon by Stephen Collins for the The Guardian . Click on the image for a bigger version. - Site J marks the spot where @Philae2014 will land on comet 67P. 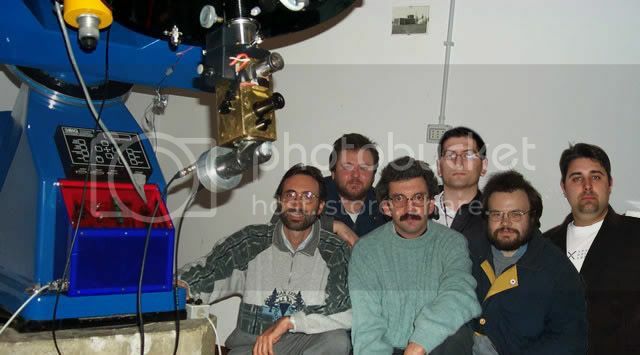 Full story on Rosetta blog here.